Well the summer monsoons are over and the river has dwindled down to a creek. 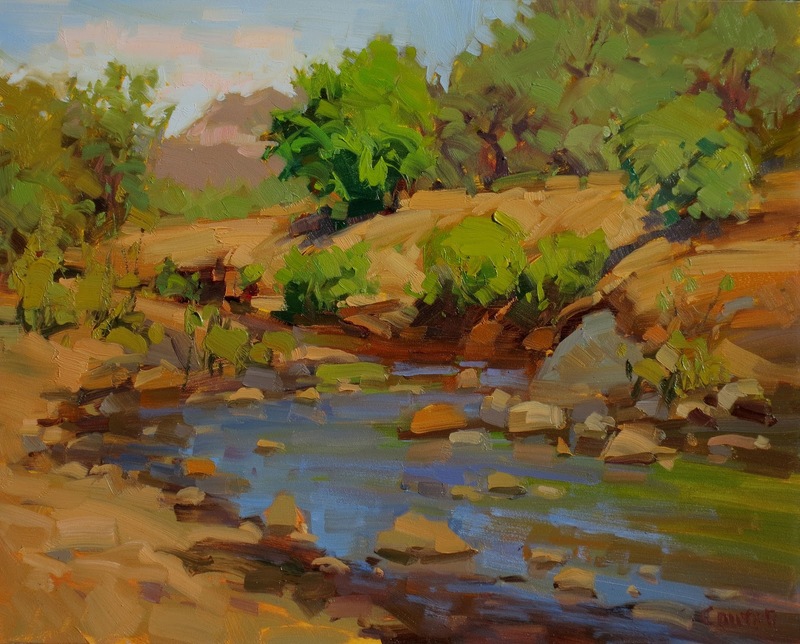 The mornings here in the AZ desert have become very pleasant for anything, especially a walk down to the river with the dogs to paint. I have started my fall classes at Scottsdale Art School. Click to check them out. I am going to do 2 one day workshops this Winter and 2 more in the Spring. If you are in the area, they will be a lot of fun. Going up to historic Jerome, AZ, Sedona Red Rock, Salt River Canyon, and the Gold King Mine with it's Ghost Town and old trucks. The other class is a long time favorite, Basic Painting and Design Part 1 & 2 that is held every Sat. morning. I have a BFA in Painting and have studied with many of the top artists in the country. I reached a point in my life where I wanted to do something with art everyday. That's when I sold my business and all my belongings and with my dog headed out for the hills in a small travel trailer. I became a full time RVer for over 10 years. I was camping out in the most scenic spots in this wonderful country. Before long I was invited to paint in many of the top "Plein Air Events" in the country. (Laguna Invitatinal, Rocky Mountain National Park, Telluride, LaJolla, Maynard Dixon Country, etc.) I prefer to paint from life, but I do large studio work too. (Using my Field Studies as reference) I like to keep my work fresh by painting new things in new ways. I get bored with painting the same subject matter in the same way all the time. I invented an outdoor easel called the Coulter Plein Air System that can be found at artboxandpanel.com. You can find out more about me at jamesmcoulter.com.